If the SureBackup job is configured to perform malware scan, Veeam Backup & Replication scans data of VMs from the application group and the verified VM with antivirus software. 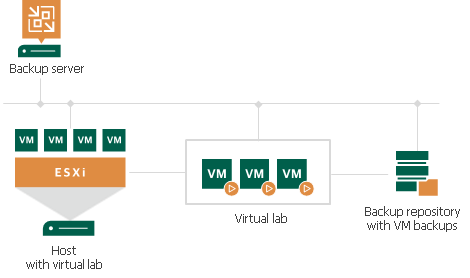 Veeam Backup & Replication publishes VMs from the application group and the verified VM in the isolated environment — virtual lab. VMs are started directly from compressed and deduplicated backup files that reside on the backup repository. To achieve this, Veeam Backup & Replication utilizes the Veeam vPower NFS Service. If the SureBackup job is configured to perform malware scan, Veeam Backup & Replication scans VM data with antivirus software. Veeam Backup & Replication performs a number of tests against VMs in the application group and verified VM: heartbeat test, ping test and application test. If the SureBackup job is configured to validate backup files, Veeam Backup & Replication performs a CRC check for the backup file from which the verified VM is started and, optionally, for backup files from which VMs in the application group are started. The backup file validation is performed after all verification tests are complete. When the recovery verification process is over, Veeam Backup & Replication unpublishes VMs and creates a report on their state. The report is sent to the backup administrator by email. During verification, a backed-up VM image remains in read-only state. All changes that take place when the VM is running are written to redo log files that are stored on the datastore selected in the virtual lab settings. When the recovery process is complete, the redo logs are removed. Application group. During recovery verification, the verified VM may need to be started with a group of VMs on which it is dependent. The application group enables full functionality of applications running inside the VM and lets you run these applications just like in the production environment. Virtual lab. The virtual lab is the isolated virtual environment in which the verified VM and VMs from the application group are started and tested. SureBackup job. The SureBackup job is a task to perform recovery verification. You can run the SureBackup job manually or schedule it to run automatically by schedule.